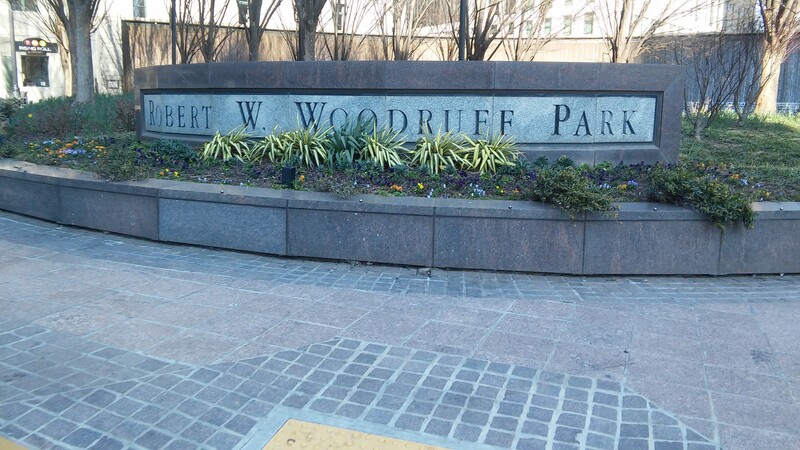 Woodruff Park, named after Robert W. Woodruff and located in the center of Downtown Atlanta, opened in 1973. It is a very well known place, used to host various events and everyday activities. In the park there is a playground, two fountains, an area to play chess and a pavilion. 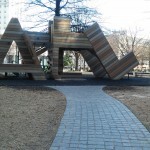 The interesting thing about the playground is that it is formed by the letters “ATL”, which looks pretty cool. It has a wooden look, various shades of brown, with a splash of color on the back and it fits well with the scenery around the park. 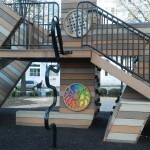 Playground provides a safe place for kids to play. To ensure their safety, there is a sign near the playground that has rules for them to follow. 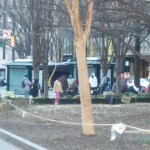 The best thing about Woodruff Park is the scenery. What I believe contributes mostly to this is the two beautiful fountains. 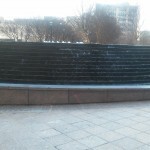 If you ever want to just sit back and enjoy the outdoors, the fountain is a good place to be. It is also great for taking photos, especially for tourists. There are tables and chairs nearby that allow people to sit and relax in the park. 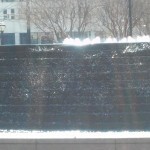 You can just close your eyes and listen to the sound of the water in the fountain or use the park as a calm and open place to get your work done, instead of staying inside. Another feature of the park is the pavilion, where you will see people playing chess. 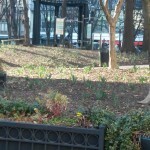 When I was there observing the park, I noticed that area was the most crowded. It was full people and it was very loud and lively. After noticing this I realized that different areas of the park attract different types of people. 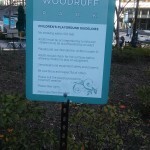 Woodruff Park is a place for pretty much anyone of any age because it has many aspects that appeal to all types of people’s needs. I saw this for myself when I went there. In one area there was a family sitting together near the fountain and a kid at the playground. In another area, there was a guy jogging past the park and a guy doing what looked like a mix of aerobics and martial arts. 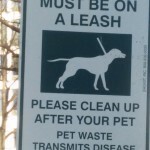 People are also able to bring their pets to the park, as long as it is on a leash and they clean up after their pets. There was a sign in the park with this rule on it. Near the pavilion, there was a large group of older men talking and laughing.There are also homeless people in the park that hang out in that area. The pavilion seems to be the area that is crowded most of the time. 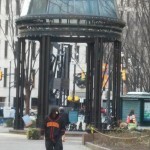 Overall, Woodruff Park is place for everyone and is a relaxing space. As long as the rules of the park are followed, everyone can enjoy themselves. 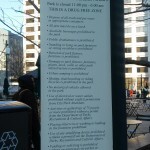 With that being said,there is also a sign with the park rules and regulations. I have noticed that signs with rules on them is common artifact in the park. 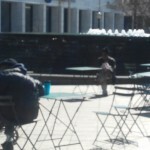 While I was in the park, I decided to sit at one of the tables near the fountain. I felt really relaxed and peaceful. I sat there for about thirty minutes, observing that area, before I got up to walk around, and it felt like I was only there for five minutes. I was so relaxed that I lost track of time.I think I will go back to the park again another day.